When I decided to “check out” ADLT 640 and see what all “the fuss” was about behind “e-learning”, I had no idea how this eight-week summer course, would change and expand my perceptions of my learning environment from a four by four box into world without limits or borders. I used a rather non-traditional hybrid approach to teaching this course. We met face-to-face twice a week for the first two weeks, then met online for four weeks, and finally remet face-to-face for the final two weeks. This meant that we met half of the time face-to-face and half online…though I suspect that my students will say they spent more than half of their time online. The first two weeks were spent on the theory part of the course, and the month online was focused on the practice part. Last week, I had the students complete a self-assessment of their mastery of the learning objectives of the course, on a scale of 1 (not confident) to 5 (very confident). Of twenty-one learning objectives, sixteen averaged above 4 and the remaining five averaged between 3 and 4. I believe that this confidence flows from the experience they had online. Surely at this point in my life I had all the skills I needed in order to learn. What I wasn’t taking into account, however, was that when you learn as a team, you get more context and meaning behind the terms and ideas. You start to understand them from a number of perspectives, and that can increase the likelihood that you’ll retain that information and be able to apply it in more ways than just the situations you are familiar with yourself. 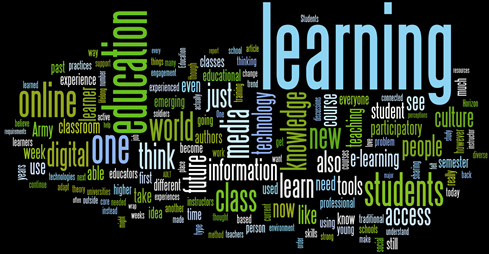 For me, e-learning is not just about participating in “online” classes. It is how the user or participant uses not only the internet and the digital tools around them, but how connected the learner allows themselves to be to that information outside the typical or traditional education environment. What if the educational shift was focused on universities connecting to one another instead of competing as separate entities? Then, learning and progressing could be a shared endeavor rather than some being front-runners and others left behind. I’m not talking about one school endorsing the other like edx for open courseware. I’m talking about schools offering elearning classes with a more global approach. Each school would still continue to have its relative distinctions, but would collaboratively build more of a connected, global, ecommunity of academia. One aspect of the class that the students all seemed to like was the collaborative building of a class library. Each week, each student added a summary and citation to a simple Google Form, that collected their work together. I bookmarked all of their articles in Diigo. Being back in class this past week solidified my (current) preference for a hybrid construction for classes. Our four-week online module proved to me how much I can learn in an online environment and how much collaboration can exist without being face-to-face. However, nothing in those four weeks came close to the rush I felt after two and a half hours of discussion in class on Tuesday and Thursday night. These eight weeks have flown by, and I will be a little sad to see this class close out tonight. It has been a positive experience for me as well, and I better understand now why the Department of Education‘s 2010 meta-analysis of eLearning suggested that a blended approach could achieve higher learning outcomes than either a purely online or purely on-campus class. I think that the 2-4-2 approach I took worked well. If I was going to go hybrid with a weekly class and weekly online, I suspect my design would be more of a flipped class. The extended online segment I chose for this class really forced both myself and my students to grapple with the challenges and find the affordances that the online environment can provide. My thanks again to some great students! You made this course a very positive experience for me! Thank YOU for a whirlwind summer! This semester has changed my view on learning online 180 degrees. Still not sure where this program will take me. I’m debating corporate vs. academic… very motivated to make a move!